What is Entrinsik Informer ? How much does Entrinsik Informer cost ? Entrinsik Informer provides a custom pricing for their software. This makes my job easy! Pros: I love that I can add a query in Informer to extract out exactly the data I need from tons of records based on the criteria I add. Cons: There is a learning curve but once you get it down, it's awesome! Overall: I have a huge database that I am working with and had to implement a new policy. In order to do that, I had to run a report with certain parameters, extract the data results from the entire database, export it, and then upload it into another system to trip some alert flags. Entrinsik Informer is a great strong and extensible data analysis platform that simplifies the access process, also because it allows the data to be manipulated easily to create reports that show exactly what I'm looking for, that is, create access for those users so that may or may not edit or view other groups of team data. I like it because it is a functional tool that allows altering the format of the data and it is easy to create a job and schedule it to run at specific times and times. It is a multifunction platform that creates personalized expressions for the fields that are required, whether it is mapping or another specific one, it is visually surprising and it gives you a great result, it creates a sales export report, programmed and automated among others. The acquisition of the license. With this tool, marketing, olap, export, programmed, sales and automated reports are made, among others, as far as my experience has been of learning regarding the creation of reports. Pros: I absolutely love Informer. It is incredibly user-friendly and very intuitive. Nearly everything I know about Informer is self-taught. 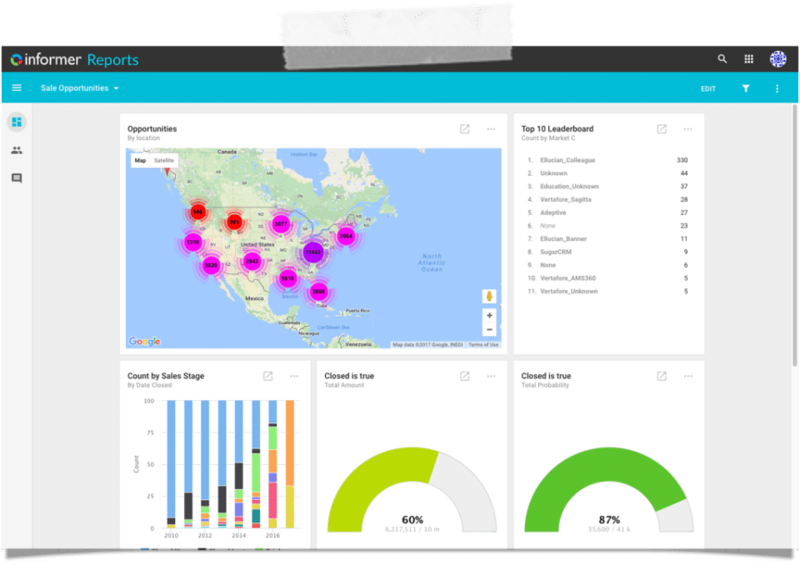 The dashboard feature was a bit more difficult to figure out, but I was still able to do it and it provided a fantastic overview of the data that our higher administration was looking for. Cons: There is not really anything that I dislike about Informer. The only issues I run across are with regards to locating pieces of data and that is not really an Informer issue. Overall: I've been using Informer for at least 8 years in my current research position at an institution of higher education. It has been a fantastic tool that has allowed me to more effectively and efficiently perform the duties of my job. Pros: Allows us to plug in several different data sources to quickly build and run user friendly reports. Quick formatting and sort options, easy aggregation, fast loading. Supports lots of formats for data export. A real software Swiss Army knife for reporting. Cons: The search functionality could be improved a little bit to be more keyword based than literal. Overall: No longer spending ages writing reports in Visual Studio based on SQL views. Can leverage old views in Informer and connect in directly to database as well. I've only crashed it once running a rogue query, it is very dependable. 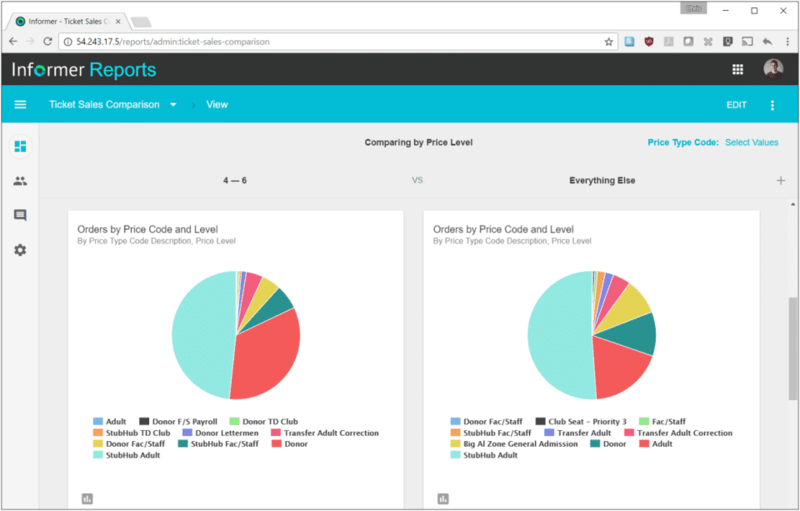 -Allows data to be easily manipulated to create a report that shows exactly what you are looking for. 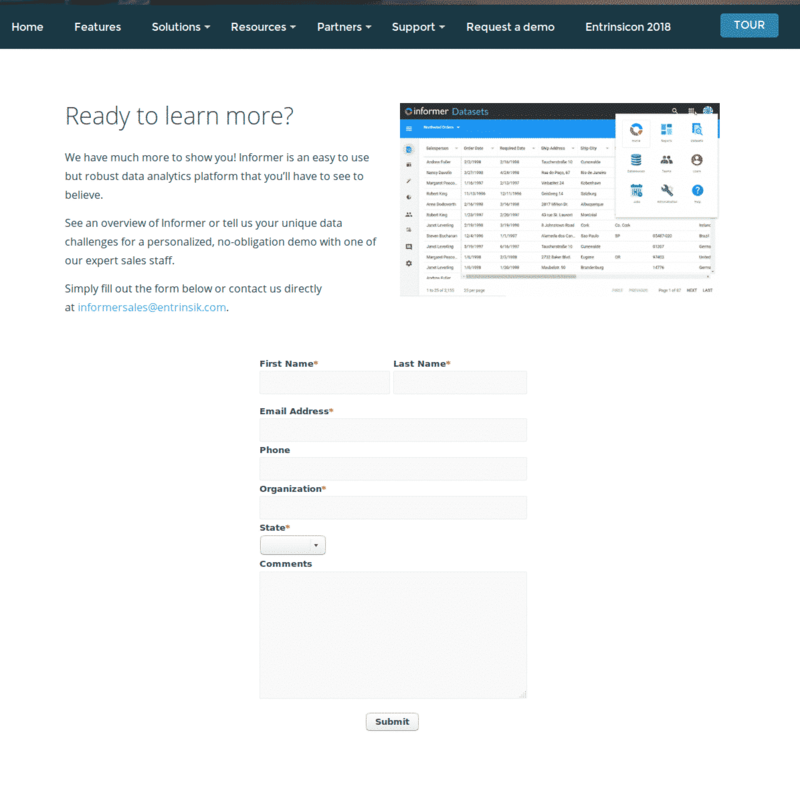 -The ability to assign Users to Teams and set permissions/access for those users so that they can or can not edit or view other Teams Datasets. -Useful tools and features that allow you to alter the formatting of the data. -Easily being able to create a Job and schedule them to run on specific days and times. -Being able to use Datasources to view the fields within each mapping as well as being able to hide those fields that you do not want end users to use. -Creating custom expressions for those fields that you need within a specific mapping. -Amazing visually and gives you a great end result. Cons: -Can be glitchy at times (ex: When editing a Dataset and organizing the columns the way you want them it tends to undo the organization when you go back into the Dataset to edit it). -Not being able to share a Dataset with a specific user. -Even as an Admin/Super User I find that I need to change the ownership of a Dataset owned by another user in order to edit the Dataset. Without changing the ownership of the Dataset over to myself I am still able to edit the Dataset but they tend to glitch and will either not show data within the field I am adding for them or the query will fail to run. However, when I change the ownership of the Dataset to myself and make the same changes it works perfectly. -In Datasources it would be nice to have a column within the mappings that shows a description of the fields that end users are choosing so that there is less confusion. Overall: My overall experience with Informer has been great! There are a few tweaks that I feel need to be made and periodic glitching but other than that everything has gone smoothly. When teaching my end users how to navigate and use the product everything is very self explanatory and I hear nothing but amazing comments and compliments about Informer once they get the hang of it. 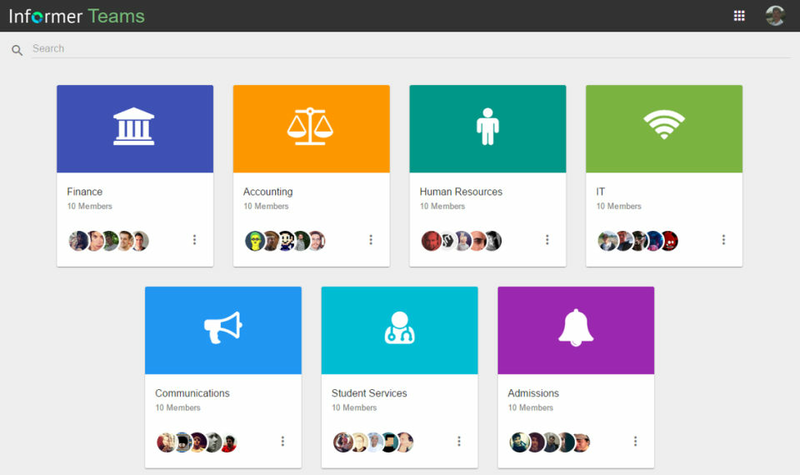 I would highly recommend Informer to other universities and organizations that would benefit from using it. Pros: I like that it's an affordable tool for a smaller company. 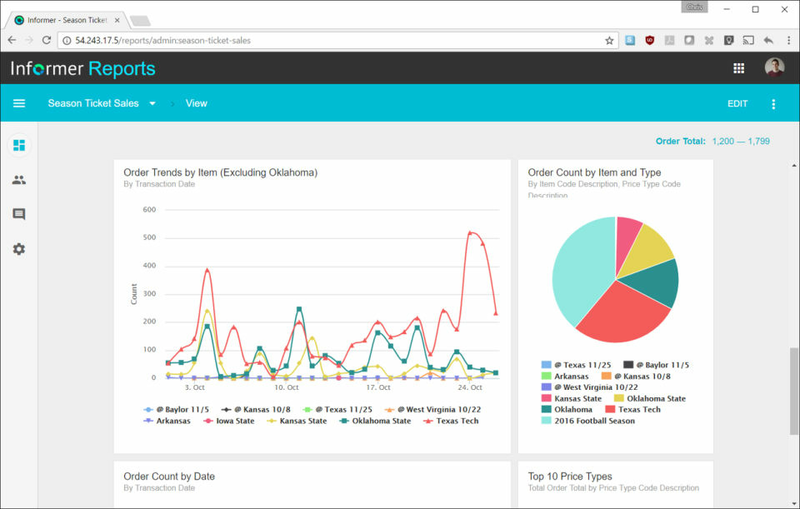 It is intuitive to set up reports and dashboards and being able to report across multiple data sources is key. Cons: There are features in Informer 4 that I need (comma-separated filters), so until that exists I have to use both Informer 4 and Informer 5. It would be better to be able to just use 5 for everything. Overall: We have had some difficulties setting up Informer 5, but the support has been very good, both knowledgeable and timely. Pros: very easy to use and web based application. In former 5 is much better now. Pros: The ability to take multiple datasources and have them all flow into one melting pot report sets it above the rest! That and the bells, whistles and gizmos this tool comes with clearly shows Entrinsik has people on the inside who KNOW what reporting people on the outside are looking for! Cons: There's a learning curve, but the more you get in there and get your hands dirty, the more intuitive it becomes. Overall: It is a high speed, low drag, Teflon coated reporting companion! The program can be set up to search for numerous types of data and in different ways. It's a versatile program. I have not found any problems with it. The program meets my needs. Your IT department programmers can create numerous types of data gathering options with this program. Highly recommended! I use Informer to gather data on a specific population of college students (RSOs) within our student database of tens of thousands of student records. The student database is an entirely different program, but Informer goes into the database and looks for special tags that are on the accounts of the specific students I'm searching for. Informer then creates a report telling me if these students are enrolled in the semester that I search. I have another Informer report that searches a specific class section and gives me the names and ages of all students in the class. I use this report for students with age restrictions. Entrinsik Informer has helped us meet federal and state requirements for managing this population of Higher Education students. It also always us to catch students who register for classes years later and may not have met disciplinary requirements. Informer gives us a heads up that they are back on our current rosters. We use Informer mainly as a reporting tool for Colleague by Ellucian which is a Unidata environment. Unidata does not lend itself to reporting friendliness. There is no way to join files together other than manual means. With Informer, we don't have to import files into a separate environment. The software connects to our live data. Once the file structure, not data, has been recognized by Informer, then we can join files together in Informer. So starting in one file and then selecting on data or using column data from other files is very simple. Without writing custom programs for each report, this functionality is just not available in Unidata. We use Informer with our Unidata environment along with a small bit of SQL. Once the files and tables are set up in Informer they are completely environment agnostic. They all look and operate the same and can be used together. There is definitely some learning to do before you become proficient in writing reports. This has been a tremendous time saver for us. Not only decreasing the time for report development but also enabling users to create their own reports. We use Informer for ad hoc reporting. The one-and-done reports are usually quick to develop. We also use it for enterprise reporting that is used in summary or detailed form. One of my favorite features is the ability to schedule a report. I have users that want to see a fresh report at the same time every week or month or quarter. It is very easy to schedule the report to run and then email the results. We also have situations where users don't need to see all the available data so Informer allows us to create limited views of the same files that might contain sensitive data. For example, we can report out of the HR module of our software without exposing compensation data to users that don't need to see that information. As a university, we use the same software to report on enrollment, academics, alumni, fund raising, financial services, human resources, etc. Reports are developed and then it is very easy to share those with either individual users or with groups of users.